Local businesses have a strong stake in well cared-for streets. Private development is a significant contributor of street improvements. Sidewalks should enable active public space and accessible pedestrian travel. Amenities such as landscaping, lighting, seating, and merchandise displays work to activate the street. These amenities should be properly organized to ensure safe and accessible travel. To accomplish this balance, a sidewalk must simultaneously be viewed holistically and through the organizing logic of a set of zones. This page contains guidelines for each sidewalk zone. The dimensions for sidewalk zones are meant as a general guide, within the overall sidewalk width. Appropriate widths for each sidewalk zone vary based on numerous conditions, such as overall sidewalk width, pedestrian volumes, adjacent land uses, presence of driveways, etc. Considerations for width of individual sidewalk zones will diﬀer for constrained sidewalks; that is, sidewalks that are below recommended sidewalk widths. All dimensions given include the width of the curb. 4’ minimum per ADA and on alleys; widening to 5’ every 200’. Adjacent uses may occupy this zone for outdoor displays, café or restaurant seating, and plantings, with appropriate permits. Architectural elements that encroach into the street such as awnings, canopies, and marquees may also occupy this zone. On sidewalks not wide enough to accommodate a large furnishing zone, elements that would normally be sited there such as benches, newsracks, trash cans and poles may occupy the frontage zone to keep the throughway zone clear. On all street types, the frontage zone should be 18 inches to provide a comfortable shy distance for pedestrians or to allow adjacent uses to utilize the space. On commercial street types, the frontage zone should be a minimum of 2 feet in width to allow for café tables and seating, benches, planting, merchandise displays, and other amenities, and higher volumes of window shopping and entering and exiting of doors. In many cases, the frontage zone should be wider to create a generous seating area. Where there is relatively little pedestrian traﬃc, or where there are continuous building setbacks, the Frontage Zone may be decreased, or eliminated altogether, as determined on a case-by-case basis. The throughway zone is intended for accessible pedestrian travel only and should be clear of obstacles, including driveway aprons or other changes to cross-slope. The walking surface may be constructed of any walkable, accessible material. In limited circumstances on narrow sidewalks, ADA-compliant tree grates may be counted toward the minimum clear path of travel; however, as they are diﬃcult to maintain to an accessible standard, this is not a preferred solution. Overhanging elements such as awnings, store signage, and bay windows may occupy this zone as long as there is a clear distance under them of at least 80 inches, as required by accessibility standards. Accessibility regulations require a clear path of travel of minimum 4 feet in width, widening to a minimum of 5 feet at least every 200 feet. Alleys should maintain a minimum 4 feet clear path of travel; all other street types should maintain a minimum 6 feet of clear. In very limited circumstances (such as neighborhood residential streets with very low pedestrian volumes), this may be reduced to 4 feet minimum. Where adjacent frontage or furnishing zones are kept clear of obstacles and are paved with an accessible surface, this width may be included in the minimum required clear width. For streets with higher pedestrian volumes, such as commercial and downtown streets, additional width should be provided to accommodate large numbers of pedestrians. The furnishing zone acts as a buﬀer between the active pedestrian walking area (throughway zone) and street traﬃc. Street trees and other landscaping, streetlights, site furnishings, traﬃc and parking poles and equipment, utility poles and boxes, ﬁre hydrants, and other site furnishings should be consolidated in this zone. The furnishing zone may be diﬀerentiated from the throughway zone through paving scoring, materials, or edge treatments to indicate that the furnishing zone is a place for lingering as opposed to moving. Where street trees or sidewalk landscaping is provided, the furnishing zone should be a minimum of 3 feet in width. As the furnishing zone acts as a buﬀer between pedestrians and the roadway, the width of the furnishing zone should be based upon traﬃc speeds and volumes and whether on-street parking is provided. If no on-street parking is provided and traﬃc speeds are 25 mph or less, the furnishing zone dimension should be a minimum of 4 feet in width. For speeds of 30 mph or above, the furnishing zone should be one foot wider for every 5 mph increment in posted speed above 30 mph. In many circumstances, the furnishing zone may be considerably wider than this, to incorporate signiﬁcant planting, seating, or stormwater facilities, and give the sense of the furnishing zone as a public space. Where there is a continuous landscape treatment, a minimum 3 foot walkable path should be provided from the edge zone to the throughway zone every 20 feet, aligned with the mid-point of the parking space. The edge zone is the interface between the roadway and the sidewalk, and is intended for use by people accessing parked cars. To allow people to get into and out of parked vehicles, the edge zone should have a walkable surface. The edge zone may have some vertical elements, such as street lights, utility poles, parking meters, or traﬃc and parking signs, as long as these elements are non-continuous and allow space between for car doors to swing open and for people to access parked vehicles. Street tree basins may also intrude into the edge zone, with the same requirements. Continuous sidewalk plantings are not generally allowed in the edge zone; however, where there is no adjacent parking lane, the edge zone may contain continuous sidewalk plantings or site furnishings. On streets with no parking lane, the edge zone may be omitted. On streets with parallel parking, where there is a continuous planting strip or other continuous raised element (such as a raised planter, or stormwater planter with lip), the Edge Zone must be a minimum of 2 feet wide to allow access to parked vehicles. Regularly-spaced non-continuous elements, such as parking meters, poles and street trees and basins, may encroach to within 18 inches of the face of the curb so long as elements allow space for open car doors and for people to get in and out of cars. On streets with angled or perpendicular parking, the edge zone must be a minimum of 30 inches. The extension zone refers to speciﬁc conditions where the sidewalk extends into the parking lane. 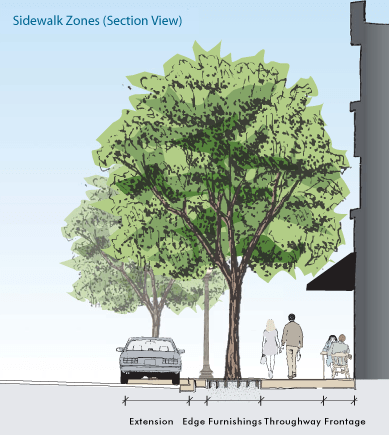 Speciﬁc examples include curb extensions, ﬂexible use of parking lanes, and bicycle parking, tree planting, and stormwater features in the parking lane. The extension zone may house elements such as landscaping, seating, stormwater facilities, and other site furnishings. Elements such as newsracks, traﬃc and parking signs, and kiosks may be consolidated in the extension zone (on curb extensions) to free up sidewalk space for through travel. Where the pedestrian realm is expanded into the extension zone, it should take up the full width of the curb extension or parking lane. See also Curb Extensions (Bulb-outs), Parklets, and On-street Bike Parking. Certain portions of the streetscape require special consideration in terms of the spacing and placement of streetscape elements. Corners (as deﬁned by an extension of the property line to the curb) should be kept clear of obstructions. They should maintain drivers’ and pedestrians’ clear views of each other. Amenities should be clustered adjacent to corners but not within the corner zone itself. Corners should include curb ramps and detectable warning surfaces per accessibility regulations. Pre-existing utility poles and sub-surface vaults may be prohibitively expensive to move, and may remain in place. However, they should be relocated as funding and opportunities allow. On residential streets, corners may include a corner planter to the width of the furnishing zone on the adjacent sidewalks, so long as suﬃcient clear width for curb ramps is maintained. Transit stops require special layout guidelines due to the high number of people often waiting near them and the need to board and alight from transit vehicles. Transit stops require special layout guidelines to accommodate passengers who are waiting, boarding or alighting, and the need for vehicles to deploy lifts. Street trees, furnishings and other obstructions should allow a minimum of 8 feet of clear sidewalk width adjacent to the curb. Special paving treatments and sub-surface utilities may be located within this zone, as long as they provide an accessible surface. Driveways present special challenges to the pedestrian due to changes in cross-slope and the presence of vehicles crossing the sidewalk. Medians can add substantial greenery to the streetscape, decrease impermeable surface, oﬀer opportunities for pedestrian refuges, and oﬀer locations for lighting and some utilities. Wide medians on some streets oﬀer opportunities for lines of trees that are otherwise diﬃcult to achieve along sidewalks. Suﬃciently wide medians (12 feet or more) generally can be designed to include seating and gathering areas and other pedestrian amenities. Medians also create opportunities for pedestrian refuges at busy intersections. See Medians and Islands and Median Greening.